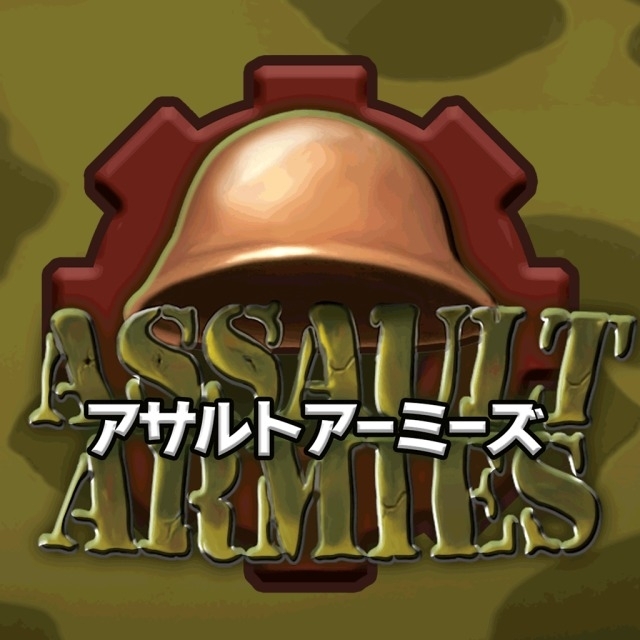 You could certainly be forgiven for never having heard of A-men (also known as Assault Armies) before. I hadn’t heard either, until I received a review code for it. Nonetheless, A-men is one of a handful of PSN-only Vita launch titles, competing with the likes of Escape Plan, Super Stardust Delta and MotorStorm: RC for your cash right out of the gates. But is it deserving of the virtual shelf space? It’s fair to say there’s nothing else like this in Vita’s software library, but A-men isn’t an entirely unique gameplay proposition in and of itself. Heavily inspired by the likes of Lemmings and Lost Vikings, with a hint of Worms thrown into the mix, A-men is what you might call a tactical platformer. You’re given control of up to five military units on a typical 2D platformer level filled with puzzles, traps, and enemy units. The goal is to eliminate a set number of enemy units on each level by utilising your characters’ skill sets before leading all of your forces safely to the evacuation point. Each one of your units has its own unique skills, design, and personality. For example, there’s the bulky muscleman whose personality is one of zen-like calm and reason (in an intentionally ironic contrast with his muscle-bound design), and his skill set includes the ability to fling friendly units across huge distances, taunt the enemies into a frenzied charge, and move heavy crates. Or take the overworked, sarcastic engineer who makes snide comments about the quality of the level design, and laments the development team’s decision to have him whack himself with a spanner while he waits for you to assess his next move. His skillset includes the ability to build and destroy structures, and paint over mines to create traps for the enemy. There are five different unit types in all, each brimming with personality. Sometimes you’ll be provided with a full complement of units, occasionally a single guy, but more often than not a team of just two or three. The levels with a large team of units to control are invariably the most challenging; they’ll often be huge levels, filled with enemy units and complex puzzles, and working out which unit to use when involves a lot of trial and error. I found the levels where you control just one unit to be the most enjoyable. They’re typically used as tutorial levels for each new unit type you’re introduced, but the way they require you to put your little fella's full skill set to good use means they tend to really shine. The enemy units are disappointing in comparison. While your own units are full of unique personality and one-liners, enemies fall into one of two types: the plain stupid variety or the ‘still stupid but I require some persuading before I’ll walk into that pit full of spikes for you’ variety. They don’t have any skills of their own, or much in the way of personality, and simply wander about on patrol. It’s a lost opportunity to add an extra layer of challenge and discovery to the gameplay. Not that the game isn’t challenging enough already. A-men really is puzzling at times. At any one time you’ll have access to a handful of levels, so you can (and probably will) skip past a tough level in order to come back to it later on, but in order to unlock additional levels you’ll need to complete one of the remaining ones you have access to. It’s a good system, giving you something to aim for without ever posing an impossibly daunting challenge. For the most part A-men ignores the Vita’s new toys. Although you can use the touch screen to look around the level and pan the camera, it feels quite cumbersome to do so; you’re better off sticking with standard control methods throughout. And yet, despite using a traditional control set-up, A-men is not without its fair share of control problems. It’s all too easy to mistakenly use a certain skill because, rather than having skills assigned to set buttons, the game automatically scrolls through hotkeys on the fly, in an attempt to make it easier to access important skills at the right time. It doesn’t always succeed. Another, more minor annoyance is the way that the camera zooms in when you switch characters. If, like me, you’re someone who likes to have the camera panned back as far as possible, in order to get as complete a view of the level as possible, then having the camera constantly zoom in at the game’s behest is infuriating. As you can tell from the screenshots, A-men features a crisp cartoon art style. While it’s not going to set the graphical world on fire - in fact it’s below average compared to most of the Vita launch line-up - it’s quite pleasing on the eye. Incomprehensibly, though, A-men suffers from quite severe framerate problems (I’d estimate I experienced them about 6 times during my time with the game), and on a couple of occasions it slowed down to such an extent that it felt like I was playing an online multiplayer game in the middle of a severe lag spike. There is a story. It’s not very good. You’ll probably skip most of it. The dialogue is casual and very light hearted (lots of ‘LOL’, ‘Duuuude’, and the like), but it feels forced and pointless. Far more entertaining are the various comments and wisecracks the units under your control make; this, alongside the funny animations and over the top death traps, is what gives the game personality, and it’s infinitely more effective than the ‘story’ dialogue in-between levels. There are 40 levels in all, split evenly across four different worlds: Forest World, Seacoast World, Winterland World, and Factory World. The different worlds help revitalise the experience just as you would otherwise start growing weary of the game, thanks to each world bringing with it a whole new coat of paint and unique puzzles and traps. You’re graded for your performance on each level, so if you’re a perfectionist there’s extra value appeal there, but for everyone else there’s essentially nothing to bring you back to the game once you’ve completed all 40 levels, unless you like your Trophies. A-men also makes use of ‘near’, allowing you to ‘drop’ useful upgrades for other owners of the game. Unfortunately, all of the decent upgrades are reserved exclusively for ‘near’; the only stuff you can buy from the in-game store for yourself consists of cosmetic changes to your units, which is somewhat disappointing. The running time’s not bad for a PSN game, but at the relatively hefty price tag of £11.99, A-men struggles to justify its asking price. 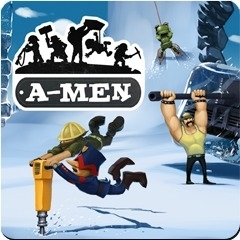 It’s great to see small, independent developers trying their hand at development on the Vita so early in its life cycle, and A-men is certainly a unique proposition in the launch line-up. 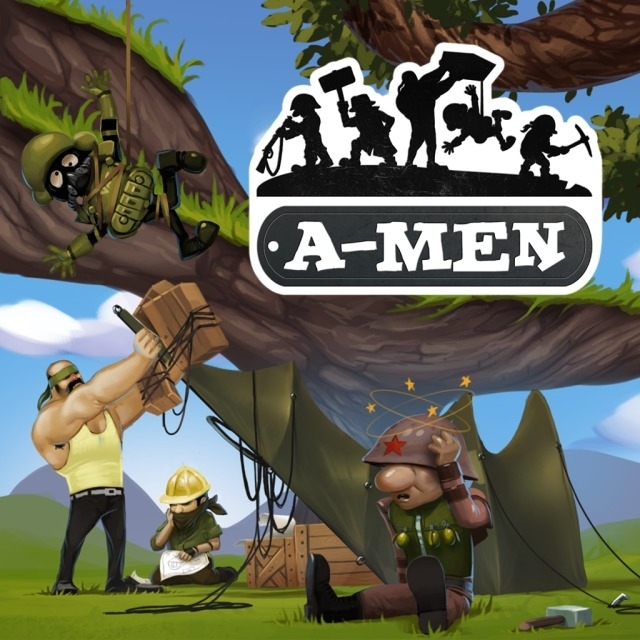 If you like supporting the little guys, and have a penchant for strategic puzzle/platformers, then A-men is certainly a title to consider – it’s solidly decent, but lacks that certain something that makes for a genuinely great game. This review is based on a digital copy of A-men for the PlayStation Vita, provided by the developer. My database work for the day, even though I cannot fix it. How does this game have no information for it>?